Nuclear physicist Enrico Fermi, as seen on a 2001 USA postage stamp. Since my last post was on Earth's hosting of life, it's natural to follow with a discussion of life elsewhere. From the outset, we must state two essential facts: first, that we have no concrete evidence that intelligent aliens have ever visited our planet; and, second, that we have no evidence that there is life outside Earth, intelligent or not. Let's look into the alien visitation question first — and leave the question of life elsewhere for another time. If ETs came to Earth at some point, they didn't leave a single clue. The countless UFO sightings, some from dumbfounded military and commercial pilots, do not work as scientific evidence. We can't, in a question of such key relevance, relax scientific criteria. Oral narratives and photos are not credible evidence. Also not credible are "studies" relating the knowledge and artistic creations of ancient civilizations to visitations from aliens. The gods were not alien astronauts. Various anthropological studies — such as those by Anthony Aveni, about the end of time and the Mayan calendar, and others — show that ancient civilizations were perfectly capable of building spectacular monuments, even when needing to transport massive boulders for many miles. If anything, these wonderful buildings are proof of our own creativity and ingenuity, and not that of some alien mind. Apart from a lack of conclusive evidence of alien visitiation, there is also the technological difficulty of undertaking interstellar space trips. As an illustration, using our fastest rocket ship to travel to the nearest star system at Alpha Centauri, at 4.5 light-years away, would take about 100,000 years or so. Even at one-tenth of the speed of light, a one-way trip would take some 45 years. Interstellar travel is an enormous barrier to dreams of cosmic exploration. There's no question that we have a lot to learn about the workings of the universe and, who knows, one day we may be able to travel close to the speed of light. But if ETs could do this, they'd be so much more advanced than we are that we'd have to wonder why they wouldn't try a more efficient way to communicate with us, apart from brief apparitions in the sky. What purpose would these furtive visits serve? 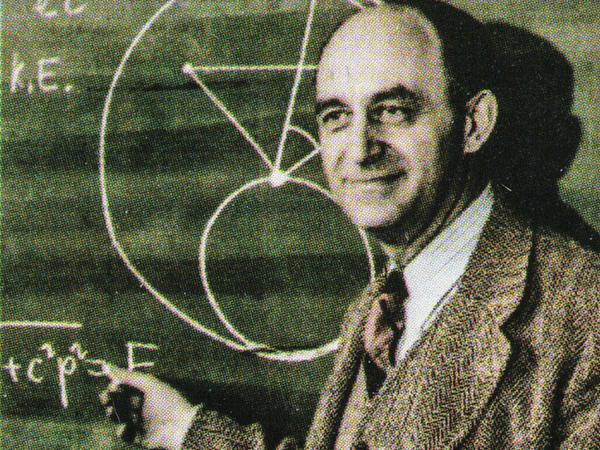 In 1950, the great physicist Enrico Fermi asked a similar question: "Where is everybody?" he asked a few friends during lunch at the Los Alamos cafeteria. A simple calculation shows that our galaxy is old enough (10 billion years of age) for a civilization that emerged a bit before us (a few million years) to have colonized the entire galaxy. We don't have room to mention all possible solutions to Fermi's Paradox (more than 50! ), but can explore a few. One is that intelligence rarely gets to our level, self-aware creatures capable of writing poetry, composing symphonies and proving theorems. If there are other intelligences in our galaxy, they'd be limited to the level of Neanderthals, for example. (Smart for sure, but outwitted by Homo Sapiens, after some intermixing.) Another solution suggests that intelligent beings in worlds covered by oceans would have trouble working with metals and other materials needed for interstellar travel. We also know nothing of what an alien psychology would be like, even if it followed Darwinian evolution, as it probably would. They may not share in our wanderlust, being advanced but quite content to restrict explorations to their own cosmic neighborhood, say, the planets and moons of their stellar system. Or, maybe, they know of our bellicose propensity and wisely decided to stay away from here. An interesting possibility is that we are a large-scale genetic experiment. The same way that we are beginning to uncover the secrets of genetic engineering, other intelligences could have created us, observing our every move from a safe distance or in stealth mode, as if we were animals in a planetary-scale zoo. This option, to me, seems to be a space version of a creator God narrative. The most important "solution," at least when it comes to our collective destiny, is that civilizations that discover nuclear power self-destruct within hundreds of years. Given the past 50 years of Cold War history and current nuclear threats, this option remains very possible, even if completely insane. All it takes is one or two unstable leaders to unleash an irreversible chain of events that could trigger a global thermonuclear war. This is where we could learn a few urgent lessons from Fermi's Paradox. If we intend to be an intelligent species that survives itself and that, in the future, will spread throughout the galaxy, we need to learn how to live with our power, developing effective ways to promote social justice and a new planetary-scale moral code that includes all forms of life and the planet that harbors them. Otherwise, we will be just another one of these possibly failed civilizations, ruined by greed, unable to realize its full galactic potential.